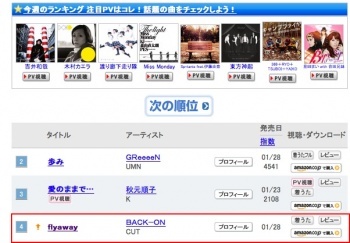 This is definitely the first time that BACK-ON has ever reached the Top 10 of any Oricon charts as themselves (they did reach #1 with Ashiato – their collaboration with GReeeeN – as part of BAReeeeeeeeeeN) and it seems that Oricon is finally recognising the achievements of BACK-ON, and have featured them in this week’ s RANKING パラダイス (RANKING Paradise)! Unfortunately we don’t really understand (fully) what is being asked during the Q&A between the hosts and BACK-ON, but there were certainly plenty of laughs and every single member of BACK-ON made a contribution. The band were also asked what GReeeeN actually looked like – a very normal question given that they’re still ‘anonymous’ – and in the end, Teeda was asked to draw a picture of their face! Oh and as Sesshy said… if you are wondering what everyone is holding in the photo above, they are inflatable Pocky. :) Hopefully we can find out what they actually said at some point, but in the meantime, do click on the link above and watch the video!